This book was signed by Ruth Rogers on 25th October 2017 in the bookshop after a delicous lunch event. 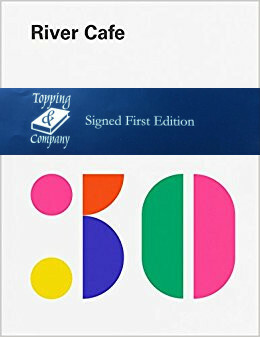 The River Cafe, one of the most influential and iconic restaurants in the world, celebrates its 30th birthday with this celebratory new book, River Cafe 30. Ruth Rogers created the River Cafe with Rose Gray and their kitchen became a hotbed for the early careers of Jamie Oliver, April Bloomfield, Sam and Sam Clark and Theo Randall. This bold and beautiful book celebrates three decades of Italian home cooking. It revisits favourites from their famous River Cafe blue book and introduces new recipes and new anecdotes from Ruth Rogers.